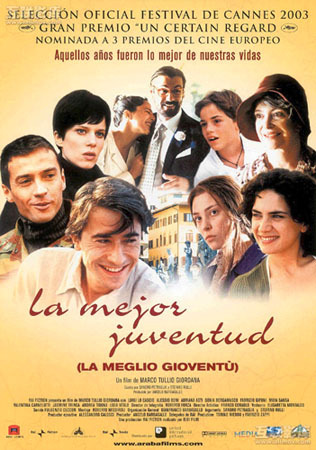 I’m amazed that The Best of Youth (La meglio gioventù – dir Marco Tullio Giordano, Italy 2003, 358 minutes) is not better known or more widely available on DVD. It’s quite simply the best film I’ve ever seen. I’m not going to attempt to synopsise since it is truly epic in every way imaginable. There is a good summary here for those who are curious, but for those lucky enough to see the film for the first time it is best simply to allow it to develop in all its mesmerising glory. The running time is certainly long (it was originally a TV mini-series) yet when the final credits roll, there can be no doubt that emotional investment is amply rewarded. Following two brothers from their student days in the 1960s to almost the present day, it is the epic as seen through the personal. We see political and social revolution unfurl through the lives of one family, all brought together in a vision of enormous warmth and feeling. And the music is great. If you can track it down, enjoy. Anyone tempted to spurn convention in favour of taking the road less travelled would do well to consult George Orwell. Keep the Aspidistra Flying (Penguin Modern Classics) brilliantly describes the tension between being true to an ideal and the necessity to live in the so-called ‘real world’. Middle class, middle aged Gordon Comstock is caught in a struggle between his respectable but dull job and a pull towards a loftier, literary existence, which is more true to himself. He finds though, that his principled rejection of the modern world and its relentless capitalism leads only to unhappiness. The question then is whether he can he find contentment in the conventional? In the end, does he capitulate or merely reassess what he wants from life? Is it simply the poverty resulting from his failed literary ambitions which forces him back into the arms of the mainstream? Or can fulfillment be found in suburbia after all? A novel for anyone who has ever dreamt of moving to the country to make a living selling vegetables at the local farmer’s market (and for would-be writers).